RIDGID 6 inch Straight Heavy Duty Pipe Wrench Sturdy, cast-iron housing and I-beam handle with full floating forged hook jaw, featuring self-cleaning threads with replaceable hook and heel jaws. RIDGID 8 inch Straight Heavy Duty Pipe Wrench Sturdy, cast-iron housing and I-beam handle with full floating forged hook jaw, featuring self-cleaning threads with replaceable hook and heel jaws. RIDGID 10 inch Straight Heavy Duty Pipe Wrench Sturdy, cast-iron housing and I-beam handle with full floating forged hook jaw, featuring self-cleaning threads with replaceable hook and heel jaws. RIDGID 12 inch Straight Heavy Duty Pipe Wrench Sturdy, cast-iron housing and I-beam handle with full floating forged hook jaw, featuring self-cleaning threads with replaceable hook and heel jaws. RIDGID 14 inch Straight Heavy Duty Pipe Wrench Sturdy, cast-iron housing and I-beam handle with full floating forged hook jaw, featuring self-cleaning threads with replaceable hook and heel jaws. RIDGID 18 inch Straight Heavy Duty Pipe Wrench Sturdy, cast-iron housing and I-beam handle with full floating forged hook jaw, featuring self-cleaning threads with replaceable hook and heel jaws. RIDGID 24 inch Straight Heavy Duty Pipe Wrench Sturdy, cast-iron housing and I-beam handle with full floating forged hook jaw, featuring self-cleaning threads with replaceable hook and heel jaws. RIDGID 36 inch Straight Heavy Duty Pipe Wrench Sturdy, cast-iron housing and I-beam handle with full floating forged hook jaw, featuring self-cleaning threads with replaceable hook and heel jaws. RIDGID 48 inch Straight Heavy Duty Pipe Wrench Sturdy, cast-iron housing and I-beam handle with full floating forged hook jaw, featuring self-cleaning threads with replaceable hook and heel jaws. RIDGID 60 inch Straight Heavy Duty Pipe Wrench Sturdy, cast-iron housing and I-beam handle with full floating forged hook jaw, featuring self-cleaning threads with replaceable hook and heel jaws. 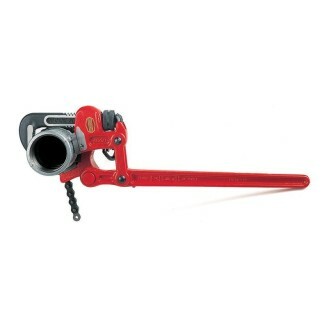 RIDGID 10 inch RapidGrip Heavy Duty Pipe Wrench Quick one-handed operation makes your jobs move faster. The spring-loaded jaw design provides rapid action. Unique combination heel/hook jaw design aggressively bites the work piece and ensures a secure grip. RIDGID 14 inch RapidGrip Heavy Duty Pipe Wrench Quick one-handed operation makes your jobs move faster. The spring-loaded jaw design provides rapid action. Unique combination heel/hook jaw design aggressively bites the work piece and ensures a secure grip. 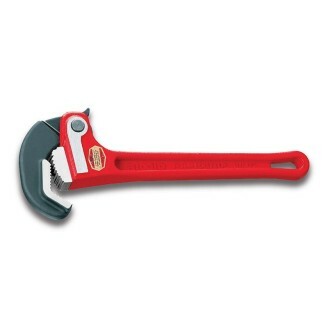 RIDGID 6 inch End Heavy Duty Pipe Wrench Assures a fast and easy grip for pipe working in restricted spaces or close to a wall. Provides a faster, easier way to get a grip and long handle swing. Ideal for pipe work close to a wall, in tight quarters or in closely-spaced parallel lines. 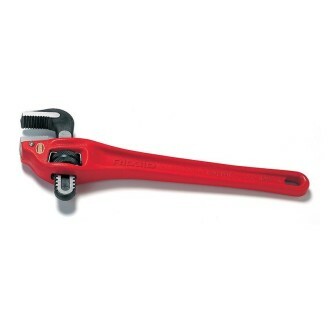 RIDGID 8 inch End Heavy Duty Pipe Wrench Assures a fast and easy grip for pipe working in restricted spaces or close to a wall. Provides a faster, easier way to get a grip and long handle swing. Ideal for pipe work close to a wall, in tight quarters or in closely-spaced parallel lines. RIDGID 10 inch End Heavy Duty Pipe Wrench Assures a fast and easy grip for pipe working in restricted spaces or close to a wall. Provides a faster, easier way to get a grip and long handle swing. Ideal for pipe work close to a wall, in tight quarters or in closely-spaced parallel lines. RIDGID 12 inch End Heavy Duty Pipe Wrench Assures a fast and easy grip for pipe working in restricted spaces or close to a wall. Provides a faster, easier way to get a grip and long handle swing. Ideal for pipe work close to a wall, in tight quarters or in closely-spaced parallel lines. RIDGID 14 inch End Heavy Duty Pipe Wrench Assures a fast and easy grip for pipe working in restricted spaces or close to a wall. Provides a faster, easier way to get a grip and long handle swing. Ideal for pipe work close to a wall, in tight quarters or in closely-spaced parallel lines. RIDGID 18 inch End Heavy Duty Pipe Wrench Assures a fast and easy grip for pipe working in restricted spaces or close to a wall. Provides a faster, easier way to get a grip and long handle swing. Ideal for pipe work close to a wall, in tight quarters or in closely-spaced parallel lines. RIDGID 24 Inch End Heavy Duty Pipe Wrench Assures a fast and easy grip for pipe working in restricted spaces or close to a wall. Provides a faster, easier way to get a grip and long handle swing. Ideal for pipe work close to a wall, in tight quarters or in closely-spaced parallel lines. RIDGID 36 inch End Heavy Duty Pipe Wrench Assures a fast and easy grip for pipe working in restricted spaces or close to a wall. Provides a faster, easier way to get a grip and long handle swing. Ideal for pipe work close to a wall, in tight quarters or in closely-spaced parallel lines. 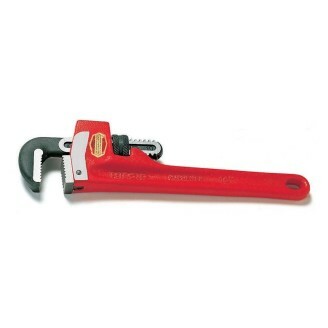 RIDGID 10 inch Raprench Heavy Duty Pipe Wrench, A deeper and broader hook jaw housing provides a smooth, flat surface that is ideal for occasional use as a hammer. 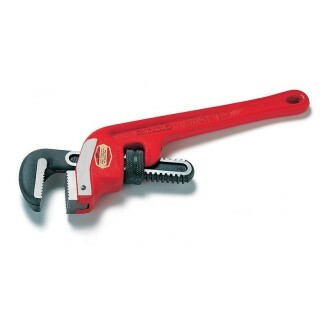 Offers all of the same outstanding qualities found in all RIDGID heavy-duty wrenches. RIDGID 14 inch Offset Heavy Duty Pipe Wrench, Features a jaw opening parallel to the handle and a narrower hook jaw head. Provides easy entry into tight spots. RIDGID 18 inch Offset Heavy Duty Pipe Wrench, Features a jaw opening parallel to the handle and a narrower hook jaw head. Provides easy entry into tight spots. RIDGID 24 inch Offset Heavy Duty Pipe Wrench, Features a jaw opening parallel to the handle and a narrower hook jaw head. Provides easy entry into tight spots. 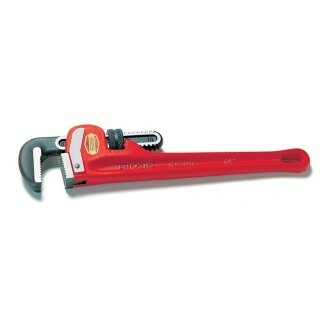 RIDGID S-2 Compound Leverage Heavy Duty Pipe Wrench, A unique design multiplies the turning force applied to a pipe. Ideal for freeing locked couplings and joints frozen by age or damage. Replaceable jaws are hardened alloy steel.